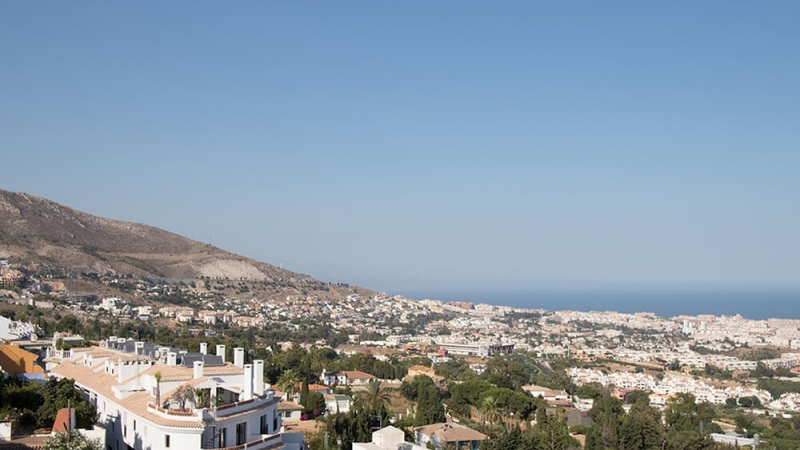 One of the most popular holiday resorts in Spain for tourists and situated on the golden sands of the Costa del Sol, it’s easy to see why Benalmadena is a great holiday choice for those looking to escape to the sun for a break. We did exactly that last summer and it was ideal for what we were looking for in a sunny holiday. Great weather, not too expensive to visit and plenty of things to do in Benalmadena whether you wanted to stay in the resort or venture further afield on day trips. Over the course of our 10 day stay in Benalmadena here are just some of the things we did and other options that were available to do in the resort during our visit in summer all put together in our handy Benalmadena tourist guide. Just a short bus ride along the coast and you’ll come to the neighbouring resort of Torremelinos which is home to the ever popular Aqualand water park. One of the top attractions near to Benalmadena for those with children and can provide a full day of fun. A word of warning though is that the park entrance fee can be quite expensive at €30 for an adult which is classed as anyone over the age of 11 years old, so if you’re looking for a more budget friendly family thing to do, this may not be the one for you. You can save a little bit of money by booking your tickets in advance on the website so that’s always worth doing for a little bit of extra spending money. Another tip to save a bit of money is to pack your own lunch. The park does allow you to take in your own food, this will save you time and money in the park as you won’t have to spend any time in the queues for the food stalls which can be quite busy during peak times. Aqualand is also a seasonal attraction and is only open during the months of May through to October. So if you’re looking for a waterpark in the Costa del Sol, then Aqualand is the one for you. Fancy some breathtaking views over the top of the resort, then head on up to the top of Calamorro Mountain by taking a ride on the cable car. Not one for those who are afraid of heights, the cars run from just outside Tivoli World (more on this soon) right up to the top of the mountain and cost around €15 per adult for a return trip and €11.50 for children return. The ride to the top takes around 15 minutes and offers views for miles on a clear day from both sides of the carriage. At the top of Calamorro mountain you can find many different walking routes, cycling routes for those who enjoy outdoor activities and a bird of prey visitor centre which offers falconry displays. (Bird centre costs extra). Along with the stunning views, this makes a great day out for those looking for a taste of the outdoors and an escape from the bustle of the busy resorts below. Just be sure to pack plenty of water if you are consdering doing the walking routes. Tivoli World is a theme park situated in Benalmadena and directly opposite where you would catch the cable car. With an entrance fee of €7.95 just to get into the park, you’ll quickly find that you actually need to pay a bit more to get on to many of the rides. You can buy a pass that allows you access to many of them for the duration of the day, but there are a few of the larger main attractions that are not included and require you to pay a bit more. Overall probably not the best value for money and the website can be a bit misleading with pricing, but if you’re stuck for things to do then this is one of the main attractions in the area. 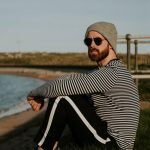 If you want to escape the very tourist oriented resort and head somewhere a little more relaxing then Benalmadena Pueblo may be ideal for you. Just a short bus journey from the beachfront and you’ll find yourself in a quaint traditional village that feels worlds away from main tourist area. Streets here are lined with traditional white washed houses and small trinket gift shops giving you a real sense of Spanish life. The streets here can be quite steep, but spend a while walking around and you’ll fall in love with them. In the centre of the Pueblo lies Plaza Espana, which is described as a traditional Andalucian square. In the centre of the square is a fountain with a statue of La Nina. Surrounding the square are a number of restaurants with both internal and external seating where you can sit in the shade of the orange trees that are growing alongside. If there’s one thing I recommend doing when visiting Benalmadena it would be taking a trip to the Pueblo. 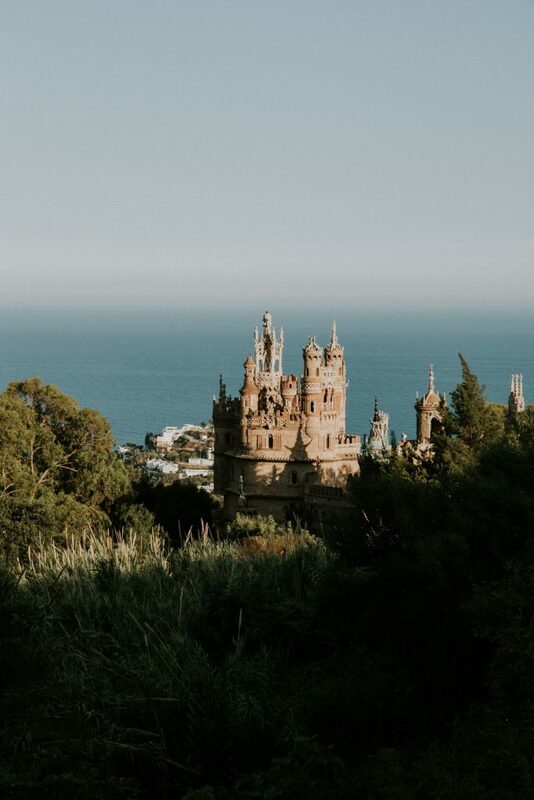 Also in Benalmadena Pueblo is the Castillo de Colomares which is a monument that takes the form of a castle dedicated to the life and travels of Christopher Columbus and also holds the record of being the largest monument in the world that is dedicated to the explorer. It’s a relatively new monument having been built between 1987 – 1994, although it holds the charm and feel of something much older. When you catch sight of the monument over the treetops on your walk down towards the entrance it really is something breathtaking, standing between the trees and the perfectly white homes and buildings dotted through the rest of the skyline. Read more about how to visit Castillo De Colomares in Benalmadena Pueblo. Just a little bit out of Benalmadena Pueblo is another of the main attractions in the area, the Butterfly Park. Here, you can get up close to over 1,500 exotic Butterfly species from around the world. Entrance fee for Butterfly world is €10 per person and they are open every day between 10am and 6pm. Learning whilst you go, this can be a great educational activity for younger children set in beautiful gardens with waterfalls and stunning plants. The park isn’t just home to butterflies though. You can see other animals like lizards, turtles and birds. Back in the main resort and it’s down to the beach to see some of the water activities that are available. One of the most popular activities to do whilst on holiday is hire a Jet Ski. There are a few companies who provide these as well as Hoverboards, Flyboards and other bits of equipment. Prices start at around €50 and No license appears to be required to hire these. Always be safe when handling things like these, they can be dangerous even though you are on water. I’ve never personally had a shot of one, but it’s something that I would absolutely love to do. Probably the main area in the resort of Benalmadena and a hive of activity both during the day and in the evening would be Benalmadena Puerto Marina. This is somewhere that we would head to almost every evening to pick from a host of different restaurants for our evening meal. The marina itself is home to hundreds of boats that are docked around the edges and you can walk the footpath admiring them all as you make your way around. As well as being great for restaurants, the marina is home to plenty of shops, amusement arcades, childrens fairground rides and more. If you’re looking for somewhere that’s great to sit with a drink and people watch then this would be it. TOP TIP: If you love Indian food, then you must check out Cinnamon Club on the top level. It is incredible! Also housed in the marina is one of the best things to do in Benalmadena for kids. Sea Life is an aquarium that is home to hundreds of different marine creatures including Sharks, Fishes, Octopus and Turtles. You can also double check the daily schedule for feeding times which is especially exciting if you catch feeding time for the sharks. Again this is another attraction that if you book your tickets online before you visit, you can save a bit of money. On the door prices start at €13.50 for children and €16 for adults at the time of writing this post. We would definitely recommend this as one of the best attractions in Benalmadena for both children and adults. It’s also probably one of the best things to do in Benalmadena when it’s raining as all of this attraction is indoors. Benalmadena also has one of Spains only five parks. A fact that we only found out after coming home. Parque de la Paloma is set back from the main beach area and feels worlds away from the rest of the resort. Filled with an incredible array of Cactus plants and Succulents from around the world. Also one of Europes largest collection of cacti with over 2000 from 450 different species. The park is also home to a number of different animals from Donkeys and Goats, to Hamsters, Guinea Pigs and Emus, which have either been placed there by the local councils or sadly abandoned by owners who no longer wanted them. All animals are cared for and looked after and are freely wandering around the park, so don’t be too afraid if one approaches you, they are all very tame and friendly. If you’re looking for somewhere to relax and take a pleasant stroll then this is somewhere that you should definitely visit. Free to enter and open until 10pm or 11pm every evening depending on the season the park is a great place to spend an afternoon with a picnic with friends and family. 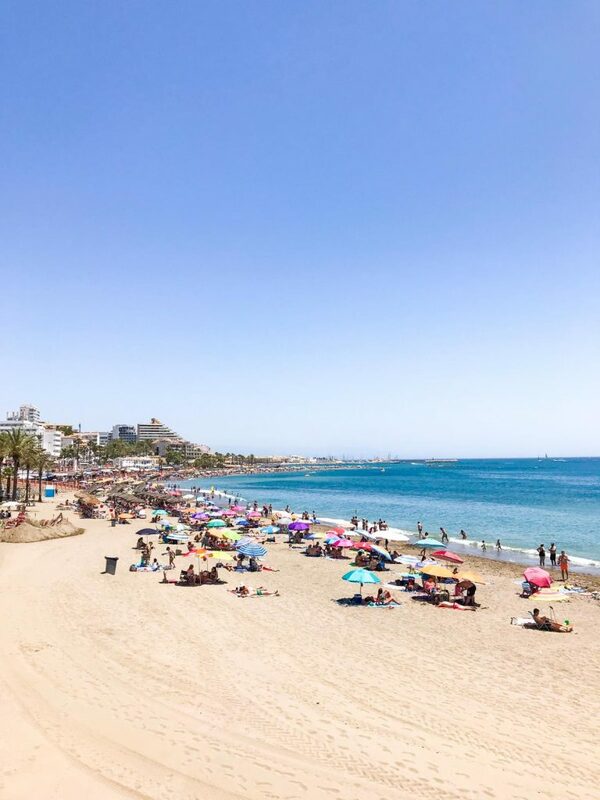 Being on the coast, it’s no surprise that the beach in Benalmadena is one of the main reasons that many people book to visit Benalmadena in the first place. The sunshine draws hundreds of thousands of people to the area each year. I personally don’t really enjoy beaches (sand gets everywhere) but plenty of people love them. 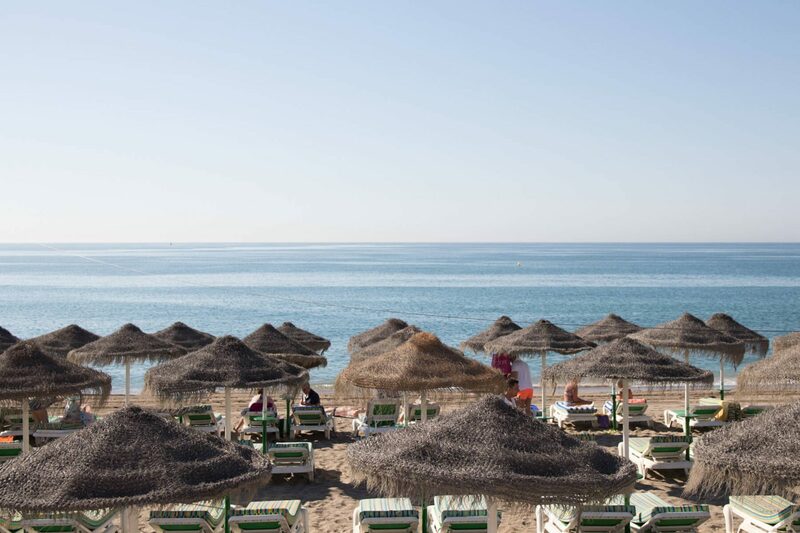 The golden sands stretch for miles and with sun loungers, restaurants and plenty of activities for all ages, you can spend endless hours soaking up the rays. If you’re looking to use one of the loungers then I believe there is usually a fee to do so, but I may be wrong. You won’t get charged anything for just chilling out in the sand on a towel, so if you’re up for saving a bit of money be sure to pack your largest beach towel and folding umbrella. One of the main things that drew us to visiting Benalmadena is how perfectly placed it was for visiting many other towns and cities. There were a number of different excursions that you could do and we ended up booking a few. Nearby Malaga was one that we decided just to do on our own as the bus to Malaga was frequent and relatively easy to navigate. Malaga is the nearest city to Benalmadena and offers plenty of things to see and do. If you’re on holiday and in the mood for shopping then head here and find many recognisable high street brands as well plenty of local independent retailers. Bus from Benalmadena to Malaga takes around an hour is an extremely affordable way to get around with fares as low as a couple of Euros for a return. 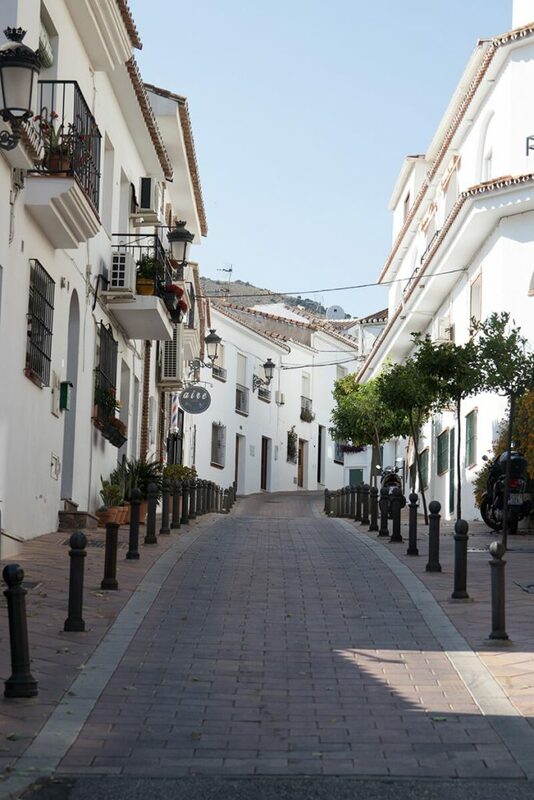 Ronda was one of our favourite day trips from Benalmadena. Located in the middle of the mountains and set on top of a huge gorge, it’s one of the most beautiful places that I think we have been to. You may be familiar with the Ronda bridge, or Puente Nuevo as it is known. One of the main tourist attractions in the city and a must see in my opinion. If you want to learn more about Ronda, you can read about how we spent a day in Ronda here. 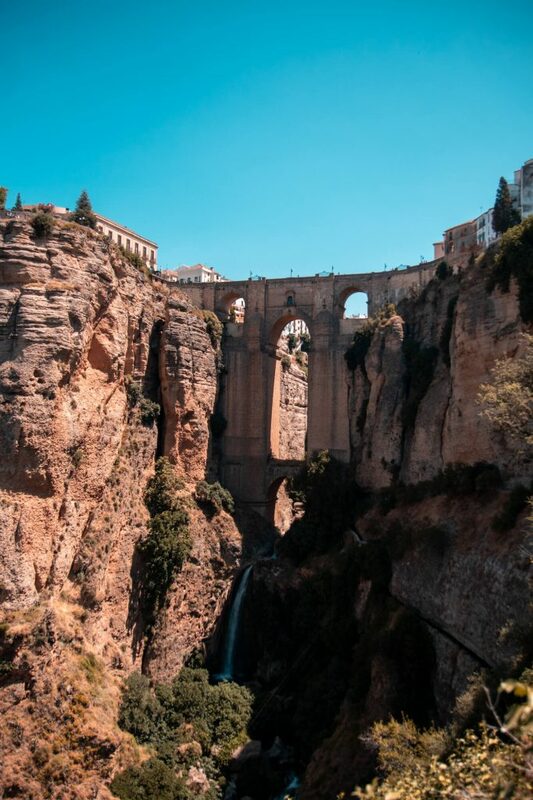 I don’t think that it would be too easy to visit Ronda by public transport, but there are plenty of good tour operators along the main promenade who will organise your day trip for you. One of the furthest way places to visit on a day trip, but another of the must visit places in Andalusia. Seville is a city and is the capital of the Andalusian region with loads of stunning tourist attractions and history worth visiting. Plaza de Espana being one of the main tourist hotspots is also where part of the newer Star Wars trilogy were filmed. Also worth checking out is the Royal Alcázar of Seville. An incredible building with hundreds of beautifully designed rooms. Be aware that the queues here are extremely long and it’s definitely worth booking your tickets online before going. Book your skip the line tickets for the Royal Alcazar of Seville here. If you’re an avid viewer of Towie, you’ll definitely be familiar with the name of this resort. Marbella is just down the coast from Benalmadena and is another place that you can visit on a day trip excursion. We stopped off here on our way back from Seville and only really had a short time to look around. 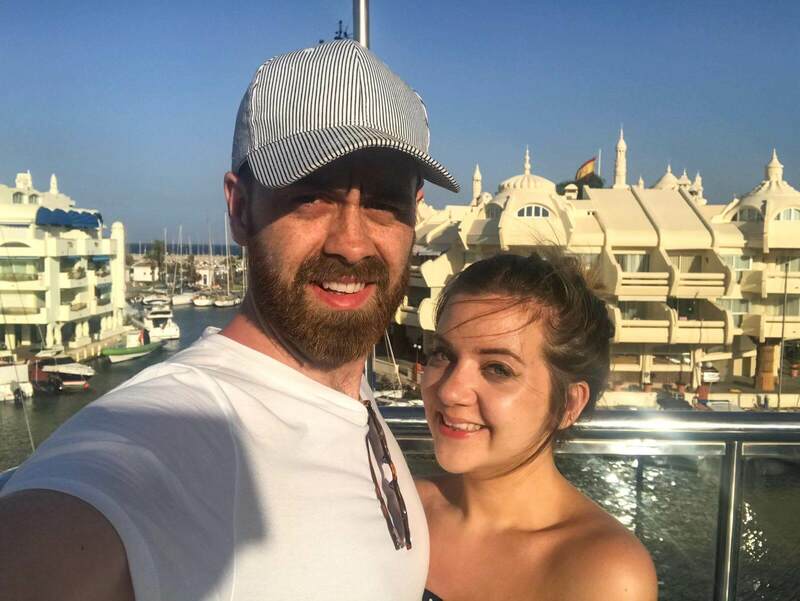 Our first impressions were that it was relatively similar to Benalmadena in terms of the shops and things on offer, but if you fancy a change of scenery it’s a trip you would probably be able to do using public transport rather than booking a day trip with a tour guide. 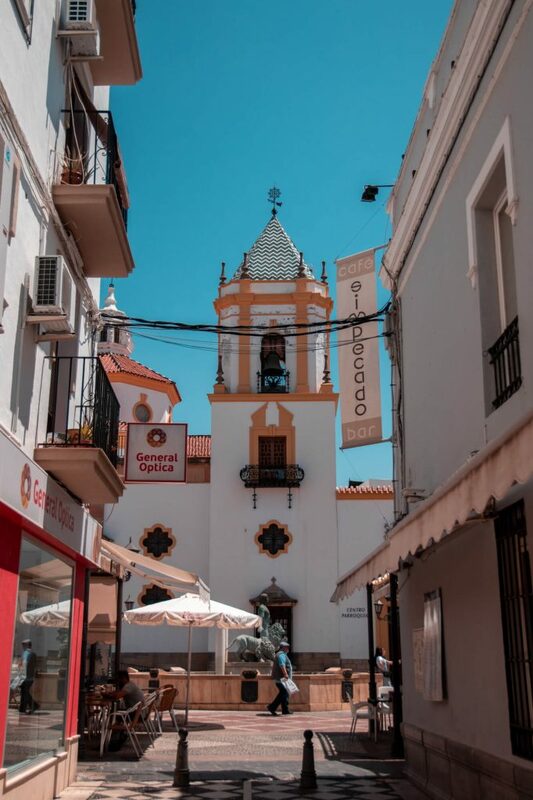 I think that just about covers almost everything in the area and hopefully gives you plenty of ideas of what to do in Benalmadena, but if there’s anything that you want to know or think that we’ve missed out then do leave us a comment below. I’ve never heard of Benalmadena but after reading your post, I’ve added it to my #bucketlist! Thanks for the great info. I hadn’t heard of Benalmadena before this either. Going to pass on this info more my niece who is going to Spain in spring. Resorts wouldn’t usually be my thing. However, the pueblo looks just perfect. 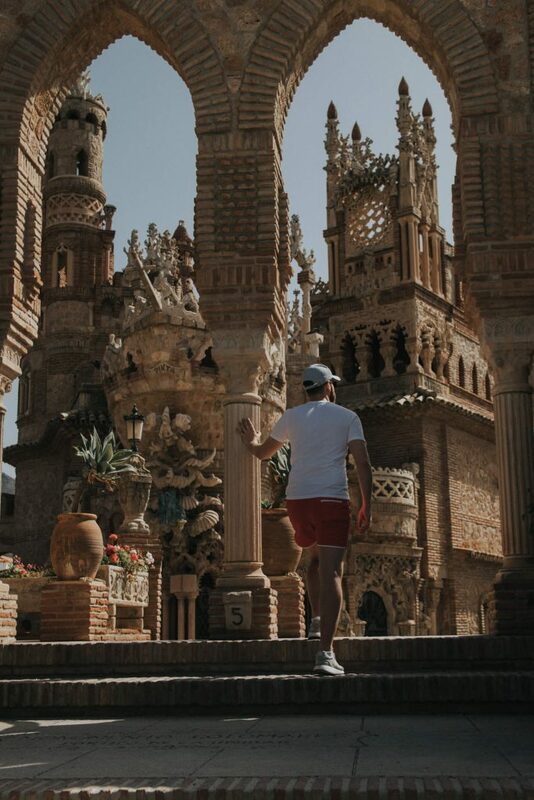 Also, I’d definitely go on day trips to Malaga and Ronda. The latter is particularly appealing. In fact, it’s been on my bucket list for a very long time.